Michael Benjamin Bay (born February 17, 1965) is an American movie director, producer and actor. He is known for his high-budget action movies which often use a lot of special effects, especially explosions. These include Transformers, Transformers: Revenge of the Fallen, Transformers: Dark of the Moon, Transformers: Age of Extinction, Nightmare on Elm Street, Friday the 13th, The Texas Chainsaw Massacre, Bad Boys, Pearl Harbor, and Armageddon. Bay was born on February 17, 1965 in Los Angeles, California. He studied at Wesleyan University. His cousin-in-law is actor Leonard Nimoy. 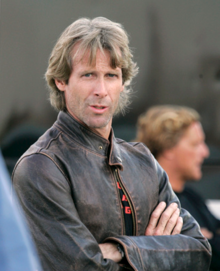 Michael Bay began working at Propaganda Films, directing commercials and music videos, two weeks after finishing his post-graduate degree.[source?] His 90-second World War II-inspired Coca-Cola advertisement was picked up by Capitol Records. His first national commercial for the Red Cross won a Clio Award in 1992. Bay's success in music videos gained the attention of producers Jerry Bruckheimer and Don Simpson, who selected him to direct his first feature-length film, Bad Boys. The film was shot in Miami in 1994 and starred Will Smith and Martin Lawrence. The action film proved to be a break-out role for Smith, who was segueing from television to films at that time. Shooting in Miami was a good experience for Bay who would later own a home in the city and spend a great deal of time there. The film was completed for $19 million and grossed a remarkable $141 million at the box office in the summer of 1995. Bay's success led to a strong partnership and friendship with Jerry Bruckheimer. His follow-up film, The Rock (1996), was an action movie set on Alcatraz Island, and in the San Francisco Bay area. It starred Sean Connery, Nicolas Cage and Ed Harris. It was also produced by Jerry Bruckheimer and Don Simpson, the latter of whom died five months before the film's release. The film is dedicated to him. Connery and Cage won 'Best On-Screen Duo' at the MTV Movie Awards in 1997 and the film was nominated for an Academy Award in the Best Achievement in Sound category for the work of Greg P. Russell, Kevin O'Connell, and Keith A. Wester. In 1998, Bay collaborated with Jerry Bruckheimer again, this time as a co-producer, as well as directing the action-adventure film Armageddon. The film, about a group of tough oil drillers who are sent by NASA to deflect an asteroid away from a collision course with Earth, starred Bruce Willis, Billy Bob Thornton, Ben Affleck and Liv Tyler. It was nominated for 4 Oscars at the 71st Academy Awards including Best Sound, Best Visual Effects, Best Sound Editing, and Best Original Song. The film earned 9.6 million dollars on its opening day and a total of 36.5 million through the first weekend. The production budget, $140 million, was one of the highest of the summer of 1998. Armageddon went on to gross over $553 million worldwide. In 2001, Bay directed Pearl Harbor. It starred Ben Affleck, Josh Hartnett, Kate Beckinsale and Cuba Gooding, Jr. The film was released on Memorial Day weekend in 2001. Again, Bay produced the film with Jerry Bruckheimer. The film received four Academy Award nominations, including Best Sound, Best Visual Effects, Best Sound Editing and Best Song. Again, Kevin O'Connell received another nomination for Best Sound, but he did not win. Pearl Harbor won in the category for Sound Editing. Michael Bay also directed the music video for nominated track "There You'll Be" by vocal artist Faith Hill.[source?] Despite all the criticisms that Michael Bay had received through the film, Pearl Harbor remained to be stagnant in the major blockbuster list, as it featured a plot which the viewers, especially young audiences, can relate with, and special effects which made the movie very realistic. Bay reteamed with Will Smith and Martin Lawrence for Bad Boys II, an event which also marked Bay's fifth collaboration with Jerry Bruckheimer. The film grossed $138 million domestically, enough to cover the production budget, and $273 million worldwide, almost twice as much as the first movie. In 2005, Bay directed The Island, a science-fiction film starring Ewan McGregor and Scarlett Johansson. It was the first film Michael Bay made without Jerry Bruckheimer. The Island cost $126 million to produce. It earned $46 million domestically and $172 million worldwide. Bay stated that he was not comfortable with the domestic marketing campaign as it confused the audience as to the true subject of the film. In 2007, he directed and teamed up with Steven Spielberg to produce Transformers, a live action film based on the Transformers franchise. The film was released in the U.S. and Canada on July 3, 2007, with 8 p.m. preview screenings on July 2. The previews earned $8.8 million, and in its first day of general release it grossed $27.8 million, a record for Tuesday box office attendance.[source?] It broke the record held by Spider-Man 2 for the biggest July 4 gross, making $29 million. On its opening weekend, Transformers grossed $70.5 million, amounting to a $155.4 million opening week, giving it the record for the biggest opening week for a non-sequel.[source?] As of November 2007, the film has made over $319 million domestically and over $708 million worldwide. Bay returned as director and executive producer for Transformers: Revenge of the Fallen, which was released on June 24, 2009 and went on to gross over $832 million worldwide. Although it received mostly negative reviews by critics, including aggressively critical reviews by American film critics such as Roger Ebert, Michael Phillips and David Denby (who referred to Bay as "stunningly, almost viciously, untalented"), the film was well received by its intended audience and was one of the highest-grossing films of 2009. In 2010, it earned seven Golden Raspberry Award nominations and winning three: Worst Picture, Worst Director and Worst Screenplay. Bay directed Transformers: Dark of the Moon, released on June 28, 2011. He may direct a sequel to the Bad Boys franchise or a "small" film he's been developing for years, tentatively called Pain & Gain. The true crime story, based on events described in a Miami Herald article written by Pete Collins, concerns a group of bumbling bodybuilders working together to commit a robbery. Even though most his movies have made a lot of money, many movie critics do not like his work. He has often been made fun of and/or named as the worst working director. He has consistently topped or appeared in Worst Directors lists by users on Internet Movie Database (IMDB). In response to the criticism, Bay has said: "I make movies for teenage boys. Oh, dear, what a crime." ↑ "Armageddon (1998) – Box Office Mojo". 1998-10-11. Retrieved 2010-07-09. ↑ "Transformers: Revenge of the Fallen (2009)" – via www.rottentomatoes.com. ↑ Ebert, Roger (2010-06-23). "Reviews – Transformers 2: Revenge of the Fallen". Roger Ebert. Retrieved 2010-08-25. ↑ Philips, Michael (2009-06-24). "And the popcorn transforms into earqplugs". Live!. Chicago Tribune. Retrieved 2010-08-25. ↑ "30th Annual Dis-Honors for Cinematic Dreck: RAZZIE Voters Spread the Loathe Around". Golden Raspberry Awards. 2010-03-06. Retrieved 2010-08-31. ↑ Collins, Pete (1999-12-23). "Pain & Gain". Miami New Times. Kevin Thornburg. Retrieved 2010-09-02. ↑ Kit, Borys (2010-01-20). ""Disturbia" director counts on "Four"". Reuters. Retrieved 2010-09-02. ↑ Motoko, Rich (2009-07-01). "HarperCollins Buys Series From James Frey". The New York Times. Sulzberger family. Retrieved 2010-09-02. ↑ Curtis, Bryan (15 June 2005). "Michael Bay vs. his critics". Slate Magazine. ↑ "Rotten Tomatoes T-Meter Rating of Bad Boys". Rottentomatoes.com. Retrieved 2013-02-20. ↑ "Rotten Tomatoes T-Meter Rating of The Rock". Rottentomatoes.com. Retrieved 2013-02-20. ↑ "Rotten Tomatoes T-Meter Rating of Armageddon". Rottentomatoes.com. Retrieved 2013-02-20. ↑ "Rotten Tomatoes T-Meter Rating of Pearl Harbor". Rottentomatoes.com. Retrieved 2013-02-20. ↑ "Rotten Tomatoes T-Meter Rating of Bad Boys II". Rottentomatoes.com. Retrieved 2013-02-20. ↑ "Rotten Tomatoes T-Meter Rating of The Texas Chainsaw Massacre". Rottentomatoes.com. Retrieved 2013-02-20. ↑ "Rotten Tomatoes T-Meter Rating of The Amityville Horror". Rottentomatoes.com. Retrieved 2013-02-20. ↑ "Rotten Tomatoes T-Meter Rating of The Island". Rottentomatoes.com. Retrieved 2013-02-20. ↑ "Rotten Tomatoes T-Meter Rating of The Texas Chainsaw Massacre: The Beginning". Rottentomatoes.com. Retrieved 2013-02-20. ↑ "Rotten Tomatoes T-Meter Rating of The Hitcher". Rottentomatoes.com. Retrieved 2013-02-20. ↑ "Rotten Tomatoes T-Meter Rating of Transformers". Rottentomatoes.com. Retrieved 2013-02-20. ↑ "Rotten Tomatoes T-Meter Rating of The Unborn". Rottentomatoes.com. Retrieved 2013-02-20. ↑ "Rotten Tomatoes T-Meter Rating of Friday the 13th". Rottentomatoes.com. Retrieved 2013-02-20. ↑ "Rotten Tomatoes T-Meter Rating of Horsemen". Rottentomatoes.com. Retrieved 2013-02-20. ↑ "Rotten Tomatoes T-Meter Rating of Transformers: Revenge of the Fallen". Rottentomatoes.com. Retrieved 2013-02-20. ↑ "Rotten Tomatoes T-Meter Rating of A Nightmare on Elm Street". Rottentomatoes.com. Retrieved 2013-02-20. ↑ "Rotten Tomatoes T-Meter Rating of I Am Number Four". Rottentomatoes.com. Retrieved 2013-02-20. ↑ "Rotten Tomatoes T-Meter Rating of Transformers: Dark of the Moon". Rottentomatoes.com. Retrieved 2013-02-20. ↑ "Rotten Tomatoes T-Meter Rating of Pain & Gain". Rottentomatoes.com. Retrieved 2013-02-20. ↑ "Rotten Tomatoes T-Meter Rating of The Purge". Rottentomatoes.com. Retrieved 2013-02-20. This page was last changed on 15 February 2019, at 13:03.